Five more acts have been added to the 2019 MTN Bushfire lineup. South Africa's Grassy Spark, Black Motion, Trompies, Tshepo Tshola and the Jagermeister Brass Cartel will all take to the stage at the Malkerns Valley from 24 to 26 May 2019. Grassy Spark’s latest direction, as a newly-cemented five-piece, is all about a fresh perspective while honing in on what Grassy Spark is all about. Essentially, Grassy Spark is more of an idea than simply a band or a genre and in many ways they’ve now become genre neutral, owing mostly to the multiple genres they’ve indulged in since formation in 2012. Black Motion is a duo from Soshanguve, the group is made up of Thabo ‘Smol’ Mabogwane (percussionist) and Robert ‘Murdah’ Mohosana who started releasing music online in 2009. Together, they have established a great reputation as artists who are passionate about their music and would rather attract listeners through their live act of playing the drums and spinning music, while dazzling the audience with their freestyle dance moves. Trompies are legends in the South African kwaito scene – proving that the genre is indeed timeless. After 20 years in the music business, the duo most recently took to the Afropunk stage with the goal, as legendary founder Eugene Mthethwa explains, of making people dance. The legendary Tshepo Tshola has been wowing audiences for over 40 years and will make an appearance at MTN Bushfire, this year. The jazz artist has managed to stay relevant over the decades with a host of collaborations with contemporary artists including a 2017 collaboration with Cassper Nyovest. Other South African artists already announced include the immensely talented Nibs Van der Spuy; innovative acoustic guitarist, punk-inspired indie rock duo The Makeovers; Thabang Tabane; heir to the father and founder of the Malombo music Dr Philip Tabane; as well as DJ Invizible – the self-described master of staging creative guerrilla performances. South Africa’s Dope Saint Jude, a rapper and producer with a defiant, life-affirming queer perspective, has also been announced along with Eme and Moonchild from Nigeria and South Africa respectively. This year’s festival headliners include West African stars Asa and Mr Eazi, Kenya’s Blinky Bill. The rest of the 2019 lineup includes a range of cutting edge artists who are pushing the limits of performance. Ain the Machine is an audio-visual storyteller with a clear goal: to transform the way we interact with music. It is music without instruments, a concept he calls Musica Biotronica. Switzerland’s Puts Marie as an indie band has been described as a mix between a great rock ’n roll circus and theatre with strange poetry, while Colombia’s Alibombo, besides being a percussion group, is an experimentation laboratory. The lineup also includes Lizzy, a German artist who merges hypnotic drumming with wearable 3D printing, along with Aramboa, Austria’s downbeat, trip-hop, IDM, neo-soul, bass music, dubstep and jazz electronic soul combo. These artists will join a host of other acts across the various MTN Bushfire stages. 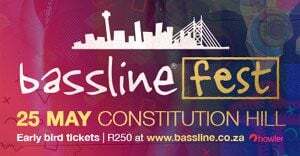 Already announced are Buddy Masango (e’Swatini); Bashayi Bengoma (e’Swatini); Morena Leraba (Lesotho); Swama lifetime achievement-winner Smiles Mandla Makama; Mahube, a collaboration of some of Southern Africa’s top musicians; Sereetsi & the Natives from Botswana; GranMah, the dub/reggae fusion band from Mozambique; Dobet Gnahoré from Côte d'Ivoire; and Maia and the Big Sky from Kenya. Tickets for this year’s festival are still available through the MTN Bushfire website, www.bush-fire.com.